This game was reviewed on Xbox One, also available for PS4 and Windows PC. Anyone who enjoys games already knows they’re a creative medium like any other, with the potential for meaningful expression beyond entertainment. But Never Alone asks an ambitious question: can video games share and preserve cultural legacies? Never Alone is absolutely gorgeous! Developed in partnership with the Alaskan Native community, Never Alone takes an Iñupiaq myth and recasts it as the adventure of a young girl named Nuna and her companion, an arctic fox. As a relentless blizzard threatens her village, Nuna and Fox journey to find the source of the storm. As they encounter a variety of friends and foes, it’s clear that nature can be helpful, hostile, and even mischievously neutral. But with patience and perseverance they press on. No type of game embodies the themes of perseverance and patience better than the puzzle-platformer. Gameplay is part detective work, as the player (or players–two people can play the full game together) figures out how to overcome the level’s obstacles; and play’s part pure coordination, as they alternately control Nuna and Fox to climb, jump, and swing the solution to success. Each level represents one of the myth’s chapters, and the influence of indigenous art styles is deliberately present in the level design. It’s worth emphasizing how gorgeous and distinct each level looks. It’s more than just ice and snow. This isn’t a staid museum piece. The Iñupiat and their traditions play a living part in our world today– a world that has video games– and these games can be used as a viable storytelling technique. That’s an important point to bring home: this isn’t interactive homework, trying to “trick” kids into learning about another culture when they think they’re playing a game. Rather, it’s the bold idea that the game itself is a legitimate way to tell an Iñupiaq tale. It works. This is a bonafide video game. Is it educational? Even a little political? Yes. 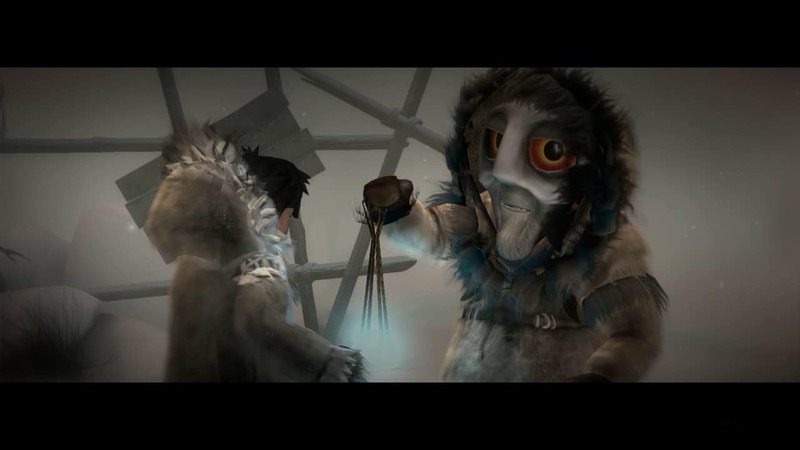 Throughout the game, players discover and watch short interviews with members of the Iñpuiaq community that explain the cultural and historical meaning behind various gameplay elements. These videos tell an engaging narrative of their own and are immediately relevant, providing context and depth to the game itself. The windblown snow results in some beautiful on screen effects. This translates beautifully into the gameplay, creating a game that’s truly cooperative. Each puzzle’s solution requires the active participation of both characters and their unique abilities. Nuna smashes the walls of ice that stand in their way, while Fox scrambles to otherwise unreachable heights. No one becomes a frustrating tag-along, meaning co-op mode may actually be the better experience. For any parent interested in games to play with their kids, Never Alone definitely deserves a look. Never Alone earns its teen rating: there’s no blood or gore, but the player confronts frightening situations of destruction and violence. One scene in particular even startled me. That said, none of this is glorified. Quite the opposite: there’s a strong message that courage and cooperation overcome greed and cruelty. Like any platformer, the game requires precise coordination. Players will spend more time trying to achieve the correct timing than they’ll spend actually working out the puzzles. However, the ratio of frustration to challenge is fair. A parent-child team, especially, will find little trouble progressing at a reasonable pace. 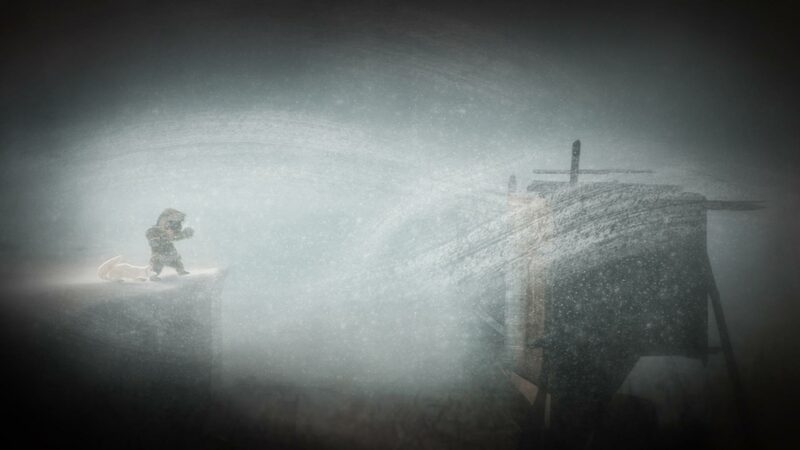 Never Alone delivers on its promise. Without feeling patronizing or gimmicky, it succeeds at being many things at once: educational, artistic, challenging, and inspiring. But, most importantly, it’s a fun little game. Anybody can appreciate that. Need a gaming fix? Low on Cash? Look to the Library!